The Centara Grand Mirage is on Wong Amat and Naklua beaches. This gives you a stretch of 230 metres of white sandy beach to play with, along with a beachfront water park too. Away from the slides, lazy river and waterfalls, there are several other places to splash out in. These include a kids’pool, infinity and lap pools. More action awaits in the Fitness and Aerobic Centre, fully-equipped, and a great place to work out. Relax and rejuvenate your mind and body with a visit to the SPA Cenvaree with its treatment philosophy inspired by traditional Thai healing. Ten luxury couples suites with private jacuzzis, as well as a dozen single treatment suites, an indoor Vichy shower experience, herbal steam room and sauna, and a yoga and meditation pavilion are just some of the pleasures here. 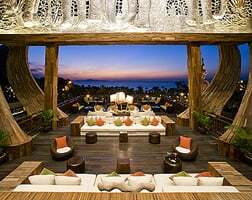 Accommodation is in one of 555 rooms or suites, all facing the ocean, and decorated in contemporary Thai style, with private balconies or terraces. For more exclusive privileges and benefits, upgrade to the Club Mirage on the 12th floor. It has its own private club lounge, and five complimentary meal/snack presentations, as well as a lot more in the line of business, check-in/out, in-room luxuries, and other ways to make your stay extra special. Water sports fans will head for the beach, which has plenty to keep you amused: windsurfing, kayaking, boating, and so on. There is a Dive Centre to help you explore the wonderful world beneath the waves. There is a Kids’ Club with a daily activity programme, including an indoor Camp Safari and Games Room for under nines. A separate E-Zone games and meeting area caters for teenage guests’ socialising and entertainment. Meeting facilities and services can handle all shapes and sizes of get-together, for business or social. From the very grand Mirage Grand Ballroom with room for up to 1200 guests, down to something more like a private board meeting, with plenty of outdoor options too, the resort’s ten venues are highly versatile. All are backed up by all the tech and slick support you could require. Of course, weddings are wonderful in this setting too, with professional planners to handle every little detail. Dining at the Centara Grand Mirage puts plenty of choice on the menu. Cuisines span the world from Western to Oriental, taking in Thai, Italian, Brazilian, with plenty of refreshment options too, both indoors and pool or beachside.